The savanna biome is usually associated with the tropical wet-dry climate 3 of Africa and South America. Its vegetation ranges from woodland to grassland. In savanna woodland, the trees are spaced rather widely apart because there is not enough soil moisture during the dry season to support a full tree cover. The open spacing lets a dense lower layer develop, which usually consists of grasses. The woodland has an open, park-like appearance. Savanna woodland usually lies in a broad belt adjacent to equatorial rainforest. In the tropical savanna woodland of Africa, the trees are of medium height. Tree crowns are flattened or umbrella-shaped, and the trunks have thick, rough bark. Some species of trees are xerophytic forms— adapted to the dry environment with small leaves and thorns. Others are broad-leaved deciduous species that shed their leaves in the dry season. In this respect, savanna woodland resembles monsoon forest. Fires occur frequently in the savanna woodland during the dry season, but the tree species are particularly resistant to fire. Many geographers think that periodic burning of the savanna grasses keeps forest from invading the grassland. Fire doesn’t kill the underground parts of grass plants, but it limits tree growth to fire-resistant species. So, many rainforest tree species that might otherwise grow in the wet-dry climate regime are suppressed by fires. Browsing animals also kill many young trees, helping maintain grassland at the expense of forest. 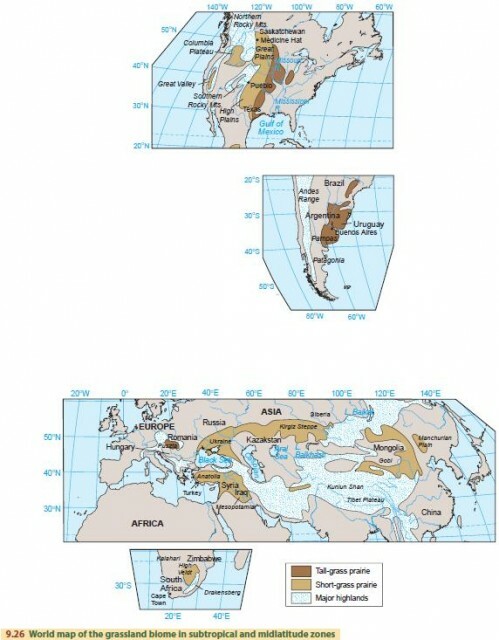 The regions of savanna woodland are shown in Figure 9.23. In Africa, the savanna woodland grades into a belt of thorntree-tall-grass savanna, a formation class transitional to the desert biome. The trees are largely of thorny species. They are more widely scattered, and the open grassland is more extensive than in the savanna woodland. One characteristic tree is the flat-topped acacia. Elephant grass is a common species. It can grow to a height of 5 m (16 ft) to form an impenetrable thicket. Savanna biome vegetation is described as rain-green. That’s because the thorntree-tall-grass savanna is closely identified with the semiarid subtype of the dry tropical and subtropical climates. In the semiarid climate, soil-water storage is only enough for plants during the brief rainy season. After rains begin, the trees and grasses quickly green up. Vegetation of the monsoon forest is also raingreen. The African savanna is widely known for the diversity of its large grazing mammals. With these grazers come a large variety of predators—lions, leopards, cheetahs, hyenas, and jackals. Elephants are the largest animals of the savanna and adjacent woodland regions. The grassland biome includes two major formation classes—tall-grass prairie and steppe. Tall-grass prairie is a ground cover of tall grasses with also some broad-leaved herbs, named forbs. Like the savanna biome, grasslands are maintained by frequent burning, which kills trees and shrubs that might otherwise dominate the grasses. As a result, trees and shrubs are not found on the prairie, but they do occur in narrow bands and patches of forest in and along stream valleys. 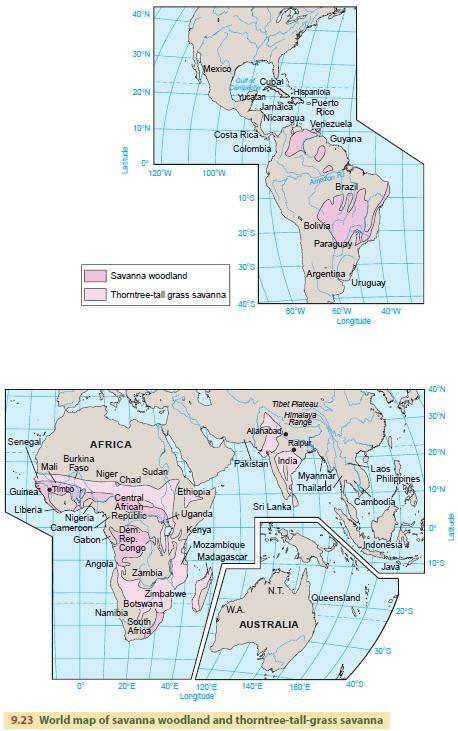 Figure 9.26 shows the distribution of grassland around the world. Prairie grasslands are associated with the drier areas of moist continental climate, and steppe grasslands correspond well with the semiarid subtype of the dry continental climate. North American tall-grass prairies once lay in a belt from the Texas Gulf coast to southern Saskatchewan, and extended eastward into Illinois. Now they have been converted almost entirely to agricultural land. Another major area of tall-grass prairie is the Pampa region of South America, which occupies parts of Uruguay and eastern Argentina. The Pampa region falls into the moist subtropical climate 6 with mild winters and abundant precipitation. Steppe, or short-grass prairie, consists of sparse clumps of short grasses. Steppe grades into semidesert in dry environments and into prairie where rainfall is higher. Steppe grassland is concentrated largely in the midlatitude areas of North America and Eurasia. The animals of the grassland are distinctive, including many grazing mammals. The grassland ecosystem supports some rather unique adaptations to life. Animals have learned to jump or leap, to get an unimpeded view of their surroundings. We see jackrabbits and jumping mice, and the pronghorn combines the leap with great speed, which allows it to avoid predators and fire. Many animals burrow because the soil provides the only shelter in the exposed grasslands. Examples are burrowing rodents, including prairie dogs, gophers, and field mice. Rabbits exploit old burrows, using them for nesting or shelter. Invertebrates also seek shelter in the soil, and many are adapted to living within the burrows of rodents, where extremes of moisture and temperature are substantially moderated.